We are conveniently located in central Ann Arbor at 1251 Rosewood Street in what is affectionately referred to as "South Town". 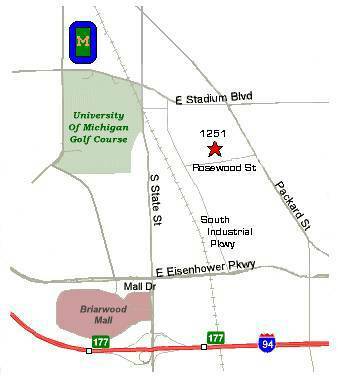 We are the closest storage facility to the University of Michigan campus (approximately 1.2 miles south of the DIAG) and easily accesible from both Packard Street to the West and South Industrial to the East. We are about 1/2 mile south of Stadium Boulevard.